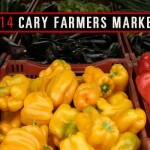 Morrisville, NC – John Scarlett, Executive Chef at Firebirds in Park West Village, got his start in a small nightclub while attending UNC Wilmington. The work fit his college schedule, it paid well, and he got fed. It wasn’t long before he fell in love with the restaurant business, and he moved up from dishwasher to cook. Two weeks ago, he was named the new Executive Chef at the Morrisville Firebirds after working four years in the chain’s Southpoint location. Other restaurants on his resume include Midtown in Raleigh’s North Hills and Atlantique in Wilmington. It was in Wilmington, that a restaurant owner saw promise in him and moved him up through the kitchen, eventually bringing in well-known chef’s to teach John the tricks of the trade. His love of cooking won out over his desire to be a marine biologist and he left college to pursue a career as a chef. 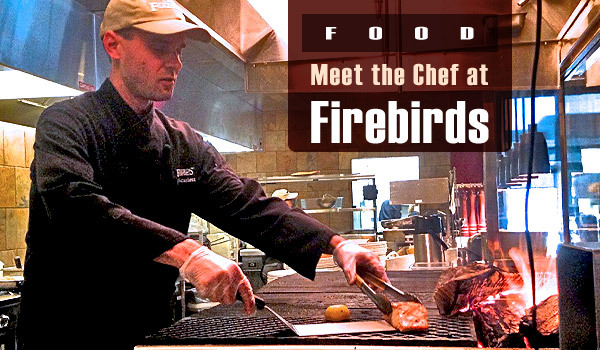 When asked about the cuisine at Firebirds, John was proud to point out that everything is made in-house, and seafood and produce are brought in four times a week. All sauces are made from scratch, and everything is checked for quality and freshness several times a day at the start of each shift. 90% of the food items come off the wood-fired grill, which is the signature of Firebirds. The grill can be seen behind a large window from the dining room, where locally grown hickory and oak logs are burning towards at the back. It’s 100% wood, no gas, that cooks the food. Coals are continually raked forward towards the front to keep an even heat all during the meal time shift. “It gets pretty hot”, John adds. I asked John what a typical day is like at Firebirds. John told me that if he works the day shift, he arrives around 7:30am. He and the assistant chefs (who are certified butchers) will start the day by butchering the meat and fish that is needed for the day. Everything is cut from whole fish and sides of beef. Other employees begin to arrive between 8-9:00am when its time to review the production list. Cooks will go over their ingredients to be sure they have everything they need on hand, John will review paperwork and inventory. He also accepts deliveries of orders for produce and seafood. Throughout the shift, they are checking the quality of the food. He pointed out that onion rings can only be prepped and used for 6 hours, before being tossed. Mashed potatoes have an even shorter shelf life of only two hours on the line. By 10:30am, they are setting up for lunch, which starts at 11am. By 2pm, the kitchen is finishing up lunch and they begin to set up for the evening. At this time, the night chef arrives for a few hours of crossover. The evening staff continues to arrive until the last chef arrives at 6pm. They serve dinner until 10pm. As the restaurant transitions to dinner, John and his staff make sure the line is clean and that all employees have finished their morning work. Then he prepares his orders for the next day. By 6pm he’s ready to go home to his family and relax. All after a 10-11 hour day. John does these 10 hour days, five days a week, typically clocking 55-58 hour weeks. 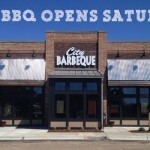 See what’s on the menu, get directions or make reservations.